Over millions of years of evolution, every kind of insect and bacterium has evolved, seeking its niche in the world. There are over a million insect species - and sometimes a gardener may think that they’re all eating the roses at once. No problem, however - we are clever. We can reach for the pesticides! Merrily, merrily, merrily, merrily, spray away disease. At first blush, the magic works. The bugs disappear. Your lawn is so immaculate you could invite the Queen to dine on it. Isn’t it amazing what modern science can achieve? But then the dogs start dying. They don’t know you’ve sprayed the lawn, and they romp and roll, finishing with a good licking to clean their paws. Between 1975 and 1995 the incidence of bladder cancer in dogs examined at veterinary teaching schools in North America increased six-fold, with Scottish terriers, Shetland sheepdogs, wirehaired fox terriers and West Highland white terriers having a higher risk than mixed breeds. When researchers interviewed the owners of Scottish terriers with bladder cancer, they found that dogs whose owners had used phenoxy acid herbicides on their lawns were four to seven times more likely to have cancer than dogs whose owners had not. And then the children start getting cancer. A 1995 study by Jack Leiss and David Savitz published in the American Journal of Public Health found that children whose yards were treated with pesticides were four times more likely to have soft-tissue sarcomas. Another study, by R. Lowengart, published in the Journal of the National Cancer Institute in 1987, found that the parents’ use of pesticides during pregnancy was linked to a 3 to 9-fold increase in childhood leukemia. And then there are the golf courses. When the 10-year-old Jean-Dominique Levesque-Reneé of Montreal was in hospital with non-Hodgkin’s lymphoma in 1994, with only a 50% chance of surviving, he did some homework. First he discovered that half the area where he had grown up on L'Île-Bizard had golf courses that were routinely sprayed with pesticides. Then he learned that the herbicide 2,4-D, linked to non-Hodgkin’s lymphoma, had been sprayed on their lawn every summer since he was a toddler. While in hospital, he met other children with childhood cancer, and built up a map of Quebec showing where they lived. 22 came from L'Île-Bizard, where the golf courses were, and their rate of childhood cancer was 37 times higher than normal. When he left hospital, he became a persistent activist for by-laws to ban the cosmetic use of pesticides. And this is where we come in. Quebec, Newfoundland, PEI, New Brunswick and Ontario all have legislation that bans the cosmetic use of pesticides and herbicides, and right now - but only until February 15th - British Columbia is gathering public feedback on its own proposed legislation. The proposed legislation as it stands is not strong enough, however. 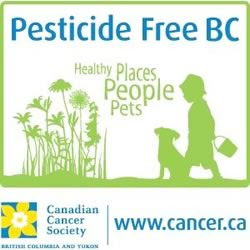 The Canadian Cancer Society has joined with a number of health and environmental organizations to call for legislation that will prohibit the use, sale, and retail display of chemical pesticides for lawns, gardens, and non-agricultural landscaping. Their ideal legislation would allow exemptions only to protect public health; provide public education about the ban and alternatives to chemical pesticides; include effective mechanisms for enforcement; exclude the use of Integrated Pest Management (IPM), which allows the use of pesticides as a last resort to deal with weeds and insects; and be passed in 2010 and fully implemented by 2012. This is politics, however, and you can be sure that the companies that sell the pesticides are lobbying for legislation that is weak and woolly. Please, for the sake of our children, our pets, and ourselves, go to www.advocate.ccsbcy.ca and send an email to reinforce the Canadian Cancer Society’s push. Five minutes, that’s all it needs. Guy Dauncey is co-author of the book Cancer: 101 Solutions to a Preventable Epidemic, from which some of this text has been taken.